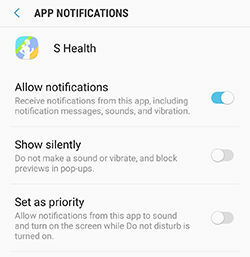 Galaxy S8+: How do I change App notifications on my Samsung Galaxy S8+ (SM-G955W)? Select which apps you want to receive alerts from. Alerts include notifications, sounds, and vibrations. 4. Touch the slider next to an app or All apps to enable or disable notifications. • Allow notifications: receive notifications from this app. • Show silently: do not make a sound or vibrate, and blow previews in pop-ups. • On lock screen: allow or hide notifications on lock screen. • Set as priority: allow notifications from this app to sound and turn on the screen while Do not disturb mode is turned on. 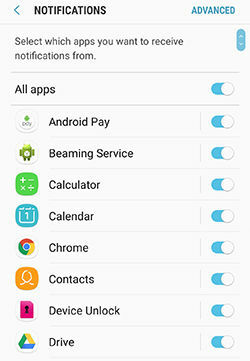 Galaxy S8+: How do I set up and use Google assistant on my Samsung Galaxy S8+ (SM-G955W)?